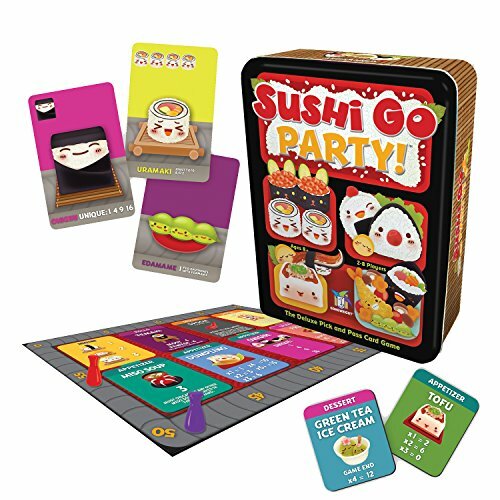 The deliciously fun Sushi Go Party! the ‘pick and pass’ card game by Gamewrite is an expanded version of their original bestselling Sushi Go! game. The mechanics of the game is card-drafting, players pick a card from a communal hand then pass the remaining cards to the next player, they choose a card and pass the remaining cards on, and so on. In Sushi Go Party! 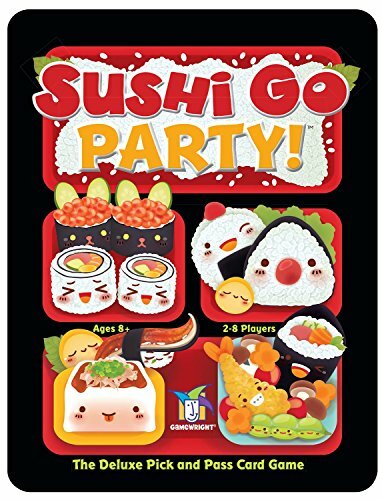 people collect cards to create a party platter filled with delectable Japanese dishes including a variety of appetizers, sushi rolls, and desserts. Players earn points by picking different sushi combos like the original game, but now each round can be customized by selecting à la carte items from an expanded menu of 20 plus dishes. This game is family friendly and really cute, but don’t let that fool you, it can be rather cutthroat! The feel of the game is like ordering from a sushi train (a conveyor belt filled with sushi plates that meanders through a Japanese restaurant). The hand of cards gets passed around and players strategically select delectable dishes like choosing plates off a sushi train. The game is rated for ages eight and above and we feel that’s accurate. It’s relatively quick to play. Sushi Go Party! is easy to learn, the mechanics of the game are simple, and there are lots of decisions that need to be made throughout each round which makes the game a bit challenging and exciting. Components consist of a small game board, 8 pawns, 181 cute animated sushi cards, and 22 menu tiles. The game components are quality like you’d expect from Gamewrite. The images on the cards are amazing and so cute! Everything fits into a nice looking embossed tin (kind of looks like a bento box which is apropos). In Sushi Go Party! Players create a menu of sushi and other accompaniments like green tea, soy sauce, and a variety of desserts. The menu items are worth points and the object of the game is to score the most. A game is played in three rounds like the original Sushi Go! At the end of round three, the player with the most points wins. The thing we love about this game is how fast each round plays. It adds a level of excitement to the game. Once players are familiar with the cards and their nuances, quick decisions ensue as players try to pick the cards that will give them the best advantage over their opponents. Gamewright included a really nice bi-fold board with this edition of the game that is used to keep track of each players scores as well as serving as a “menu”. Players choose one of the colored tokens that resemble a soy sauce bottle to move around the score track on the outside edge of the board. This is to keep track of how many points players score after each round. The first time you play the game sort your cards and tiles by type. Next, place each type into one of the slots provided in the game tin. Then, everyone should decide which cards to use in the game. There are eight different sets of cards to choose from or you can create your own set if you prefer. The wide variety of cards in this game really can shift the strategy when certain ones are paired with other items on the menu. For instance, the tofu card only scores points if you have less than three. The Soy Sauce card rewards the player that collects a variety of different cards. And, the green tea ice cream can be a game changer by awarding 12 points to any player that collects four of them! Before playing, set the “menu” with eight of the menu tiles that correspond to the set of cards you’ve selected and place them in the center of the game board. These will consist of one nigiri, one kind of sushi roll, three appetizers, two specialty items, and a dessert. There are more than 20+ varieties to choose from which really boosts the replayability! As I mentioned above, the game is played over three rounds. The proper amount of dessert cards are shuffled in each round, the number is based on the number of players. Then cards are dealt to each player and again, depending on how many people are playing, the number of cards dealt varies. Any remaining cards from the set are placed face down in a pile next to the game board. With cards in hand, be sure to keep them secret. Turns in the game happen at the same time. Every player chooses one card in their hand that they want to keep and places it face down in front of them. When all players have done this everyone turns over their chosen cards to show the group. After the revealing, all players pass their remaining hands face down to the person on their left. Players then look at their new hand and the next turn begins. This continues until there are no more cards to pass on. All of the face up cards revealed, except for the dessert cards, are scored and recorded on the score track with your soy sauce pawn. Dessert cards stay with players and are scored at the end of the game. All cards (except dessert ones) are then collected and reshuffled with the remaining ones from the set. More dessert cards are added and shuffled in. Players are then dealt the appropriate amount of cards and the game begins again. It plays the same as the previous round. At the end of the third round, all cards are scored including dessert cards. The player with the highest score wins! It’s hard not to totally love this game! Sushi Go Party is fast playing and exciting. The simplicity of it and ways you can customize the play make it a game we love to break out as a family and with friends of all ages. The clever simplicity to the game that makes it fun for kids and grownups. It’s quick to play, around 30 minutes for a game. The high number of cards and combinations give it a high replay value. The difficulty of the game can be customized to suit kids as young as eight or grownups looking for some challenging strategic play. This is a great strategic game. As far as the gameplay goes, we can’t find any major cons! We’ve read some people don’t like the packaging for the game. The tin has odd dimensions so some feel that makes it difficult to stack with other games. We haven’t found that and really love the embossed tin, we think it’s unique and kind of fun. The Bottom Line on Sushi Go Party! Sushi Go Party! is one of our favorite strategic family games! It’s an easy game to learn and play, there are lots of ways to change the game to make it different or more challenging. The art on the cards is cute and fun and the components are all quality as you’d expect from Gamewrite. 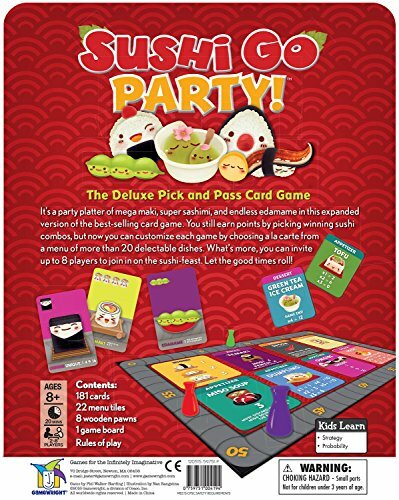 We also think the price, $21.99 for Sushi Go Party! is great value for the money. It’s challenging yet simple, the game components are quality, and it has a high replay value as well.